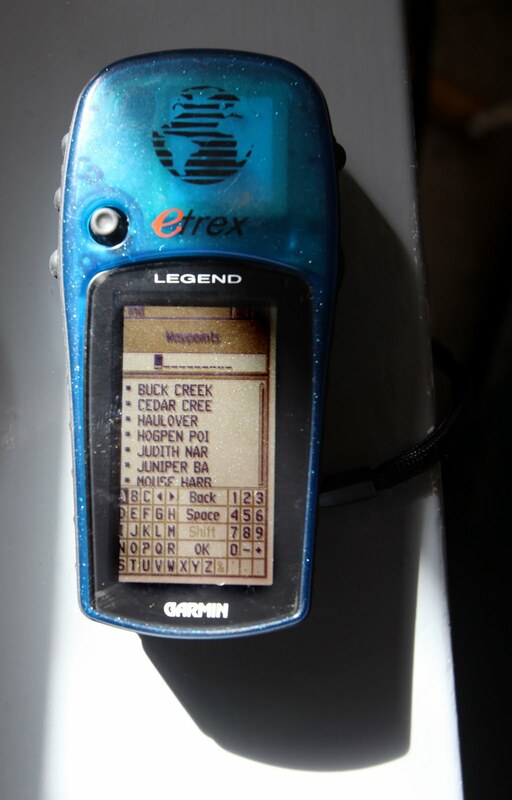 Had some spare time this morning before going into the office so got on the computer and marked my waypoints then imported them on to my etrex Legend gps. 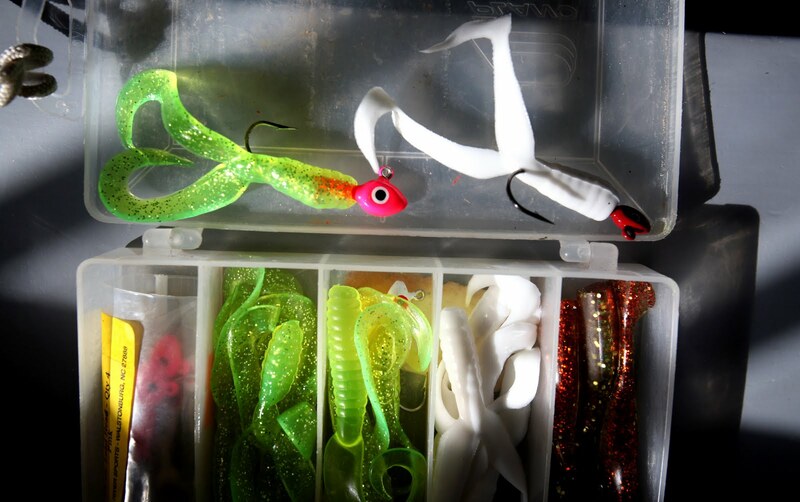 I also sorted through my fishing kit. On the walkabout I'll take mostly lead heads (1/8 ounce) in red, white and pink. I'll use soft rubber twin tail grubs, white and green ( I convince myself that the twin tails fluttered over the bottom look - at least to unsuspecting fish - like juvenile flounder or small crabs). I've also got some dark brown paddle tail grubs that supposedly work well in cloudy water. We'll see. 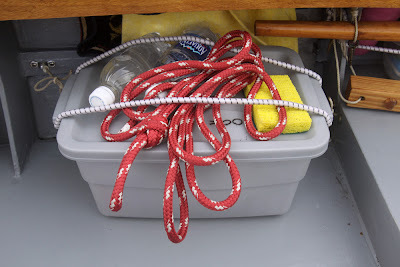 I've also changed out my fishing line to ten pound test braid (as opposed to monofilament). 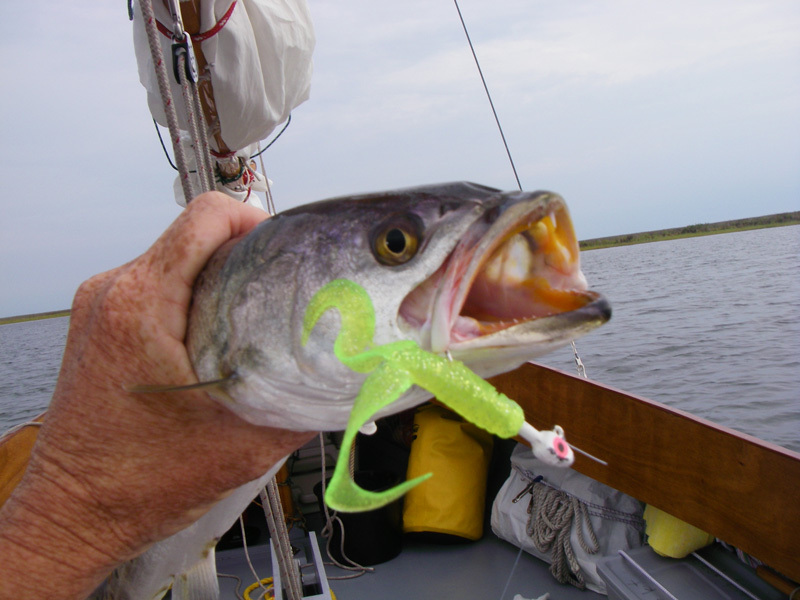 The braid casts better, holds knots better and does not degrade under uv rays. And...I did a little modification on the main gaff jaws. Touched up the varnish this morning, I've got three coats on there now. I should get four more coats over the weekend. The leather on the jaws is in better shape than it looks. Also dug up my sailing logs to find that they were full. I use mole skin note books bought in packs of three at barnes and noble. My six cruises on Spartina have filled up two of the books. So I dug around in the equipment closet until I found the last of the three notebooks. Below is a page from one of logs. 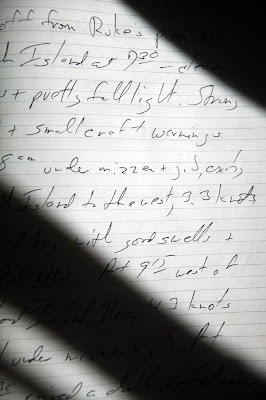 On a cruise we jot down notes throughout the day on a Rite in the Rain notebook - wind, boat speed, marker sightings, etc - then in the evening Bruce and I will each fill out our logs. 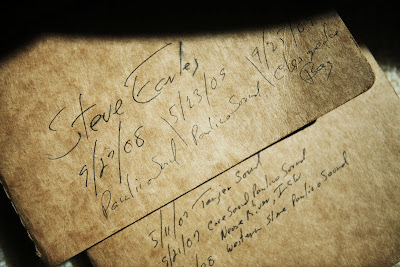 And then those logs will be used to write our web logs that you see at the right of this page. 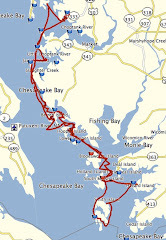 The page below is from the Chesapeake Bay sail last fall, leaving Smith Island. I'm sure the nuns at St. Columbus School will shudder when they see how I failed to take advantage of the Palmer Method. 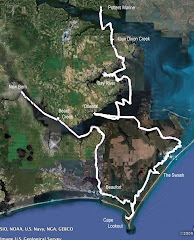 Heading off tomorrow to Morehead City, NC. I'll meet up with the USS Bataan as she heads home from relief work in Haiti. I'll get to see some good people I met down there on my Haitian Vacation. The sailors and marines on board had just returned from a long deployment when they were ordered on four days notice to head for Haiti. These are some really good people who reached out to people in need. As the captain of the warship said, they can bring help just as well as they can bring hurt. In this case they brought a lot of help. 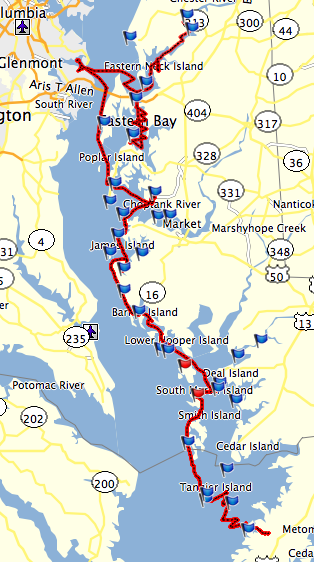 I'll get to ride back up to Norfolk with them, out and around Cape Hatteras with a great forecast of calm seas, blue skies and warm temperatures. Should be fun. 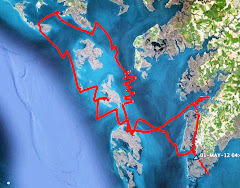 Here is the sailing area (at least that is the plan) for day three of the weekend walkabout, the marshes of Judith and Swan Quarter Islands. Lots of little coves, a couple of "narrows" and creeks. 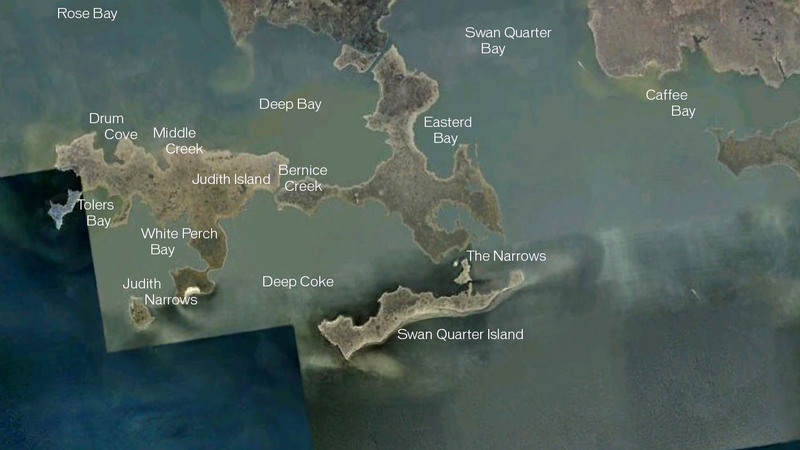 Bruce and I sailed through this area last Spring, going up Swan Quarter Bay and taking that little cut at the top of the satellite photo across to Deep Bay on a very stormy afternoon. You can read about that trip here. 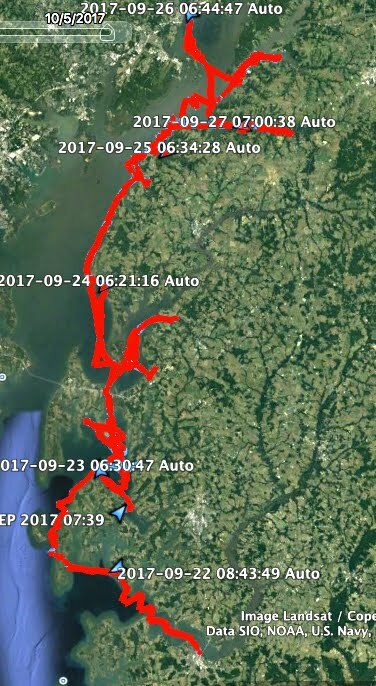 I enjoyed sailing through the area but looking at the charts I could see then that there were lots of places to explore. 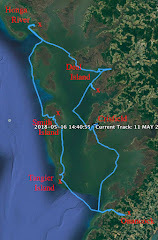 We just sailed through the series of bays on the way to our next destination (Spencer Bay, aka Mosquito Creek). Now I hope to go back and explore (and fish too). The photo above is from an '08 trip. Yes, it looks a lot like the photo I used in the last post. But that is what it looks like down there. Blue skies, blue water and a thin line of marsh grass on the horizon. Very pretty, very relaxing if you ask me. I spent a night on a solo trip anchored in Caffee Bay just east of Swan Quarter Island. That is a little storm cell that passed by in the late evening, lightning making the clouds glow. And below is a speckled trout that joined me for dinner earlier that evening. I'll take these satellite maps that I've made for the past few posts, make prints and have them laminated. They will make nice reference cards to have on board Spartina during the trip. This long weekend trip is shaping up to be fun. 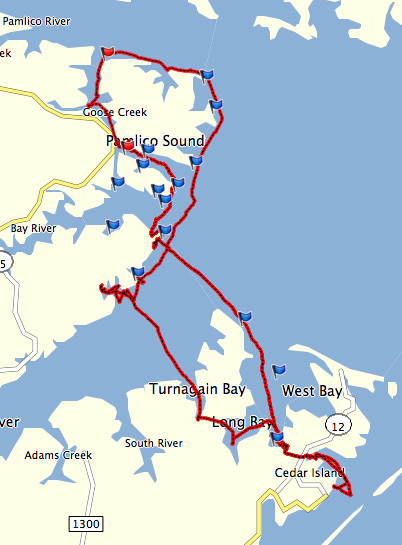 I won't cover a lot of distance, just take it easy and explore the bays, creeks and coves. This isn't a cruise, it is more like day sailing (without bothering to head back to the dock at the end of the day). 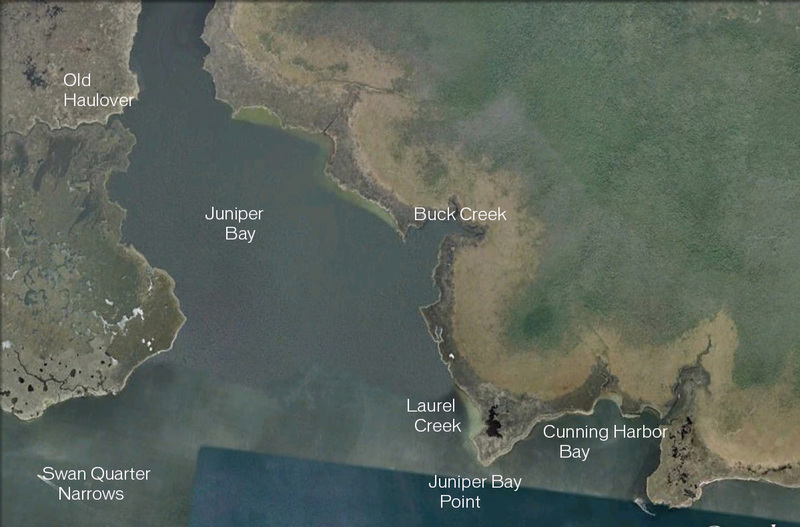 Here are a couple of satellite photos of Juniper Bay. 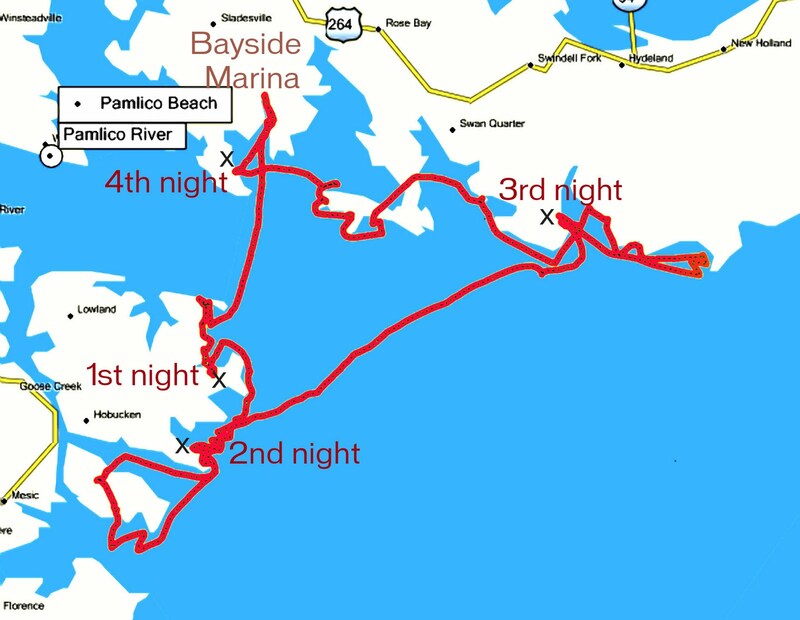 I hope to explore the bay on day two of the weekend walkabout. You can some pretty good protection regardless of where the wind is coming from. I'm thinking about sailing all the way up to the north end where the bay turns due east (at the very top of this photo). I've heard it is beautiful up there. And below is an image of the lower part of the bay. A couple of good creeks to explore and I would also like to visit Cunning Harbor Bay (a redundant but interesting name) and the tiny unnamed island on the southwest corner. I did a little research for the upcoming weekend walkabout. 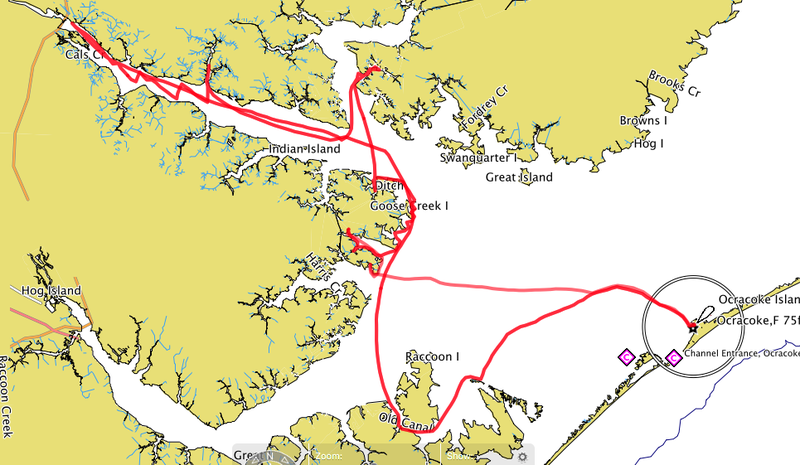 My first anchorage should be Mouse Harbor on the south side of the Pamlico River entrance. I anchored in there a couple of years ago, the fall of 08. It is a large bay, measuring about three miles (north to south) by two miles (east to west). Now that I have looked at it on a series of charts and maps - google earth, google maps, GMCO waterproof chartbook and Top Spot waterproof chart - I see that it is really a series of small bays and creeks. I can't wait to explore it. No single map has names of all the places so I compiled them all on the satellite photo below. 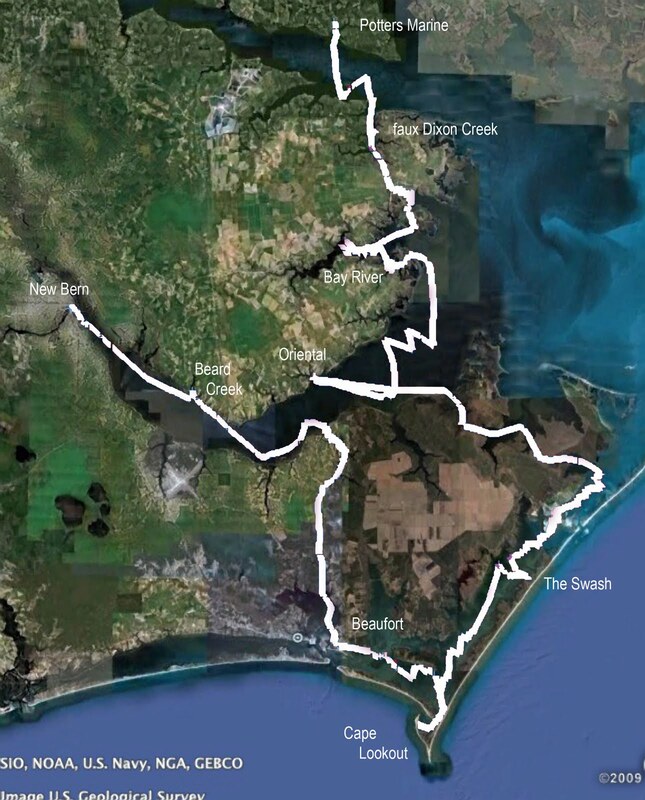 Several of the place names must be pretty common, I can guess there are at least a few Cedar Creeks and Lighthouse Points up and down the coast. But Voliva Bay, Fate Cove, Flat Cove - what is the story behind those names? I'll probably never know. But as you can see it is a coastline well worth exploring. 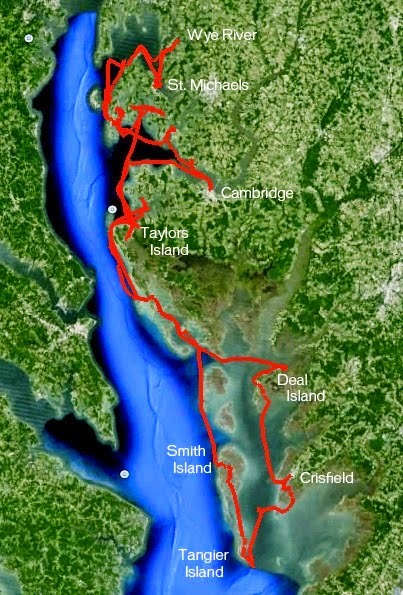 I hope to get there early afternoon on the first day and sail along the marshes and beaches. There are several spots that would provide great anchorage for the night. And with google earth I can pick out a few places with hard bottoms (as opposed to sand or mud) that would be nice spots for fishing. 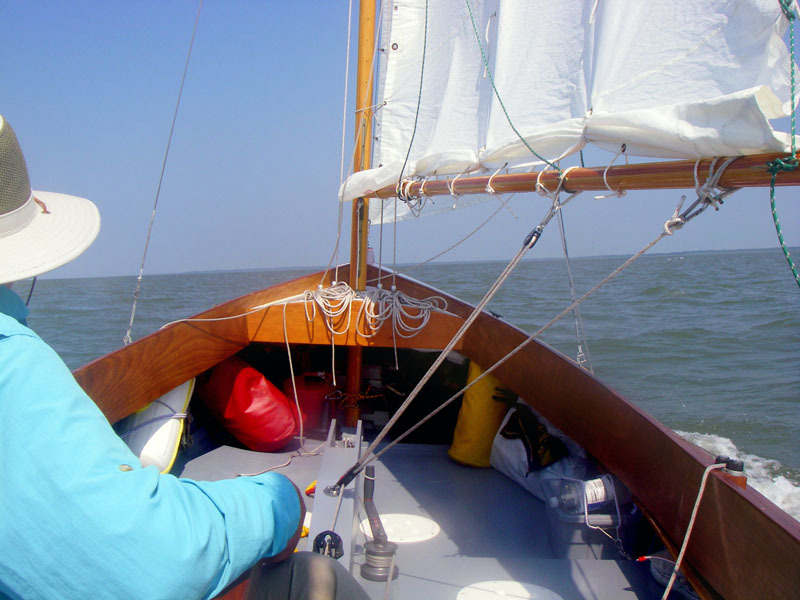 Below is a photograph from my favorite way to explore along the edge of a marsh - under mizzen and jib. 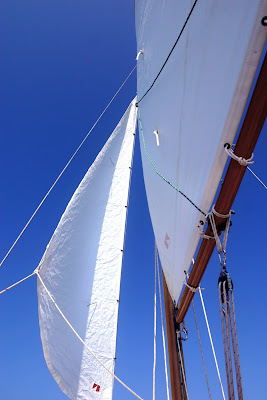 You can see the jib up forward, the mainsail tied tight to the boom. You can't see (but it is there) the mizzen, giving Spartina a nice balance in the wind. I can stand in the aft end of the cockpit, rest my arms on the main boom and control the tiller with a nudge of my foot. On the day I shot this photograph I was sliding along the marsh of Wysocking Bay in 15 mph wind out of the southwest. Very relaxing. When I wanted to stop for a while I took my foot off the tiller and Spartina turned up in to the wind and nosed up in to the marsh. 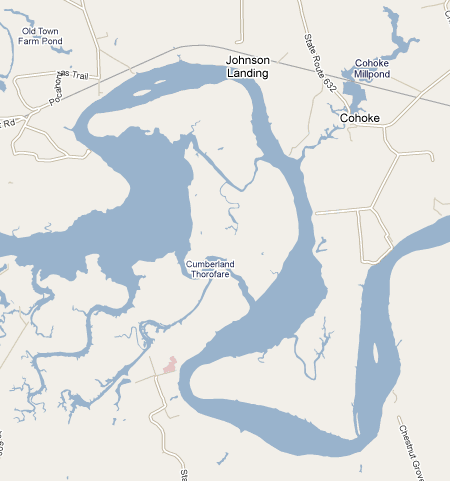 Below you can see Mouse Harbor at the junction of the Pamlico River and Pamlico Sound. It is very isolated and quiet. I did not see another boat while I was there. But I did see some other boats getting there. 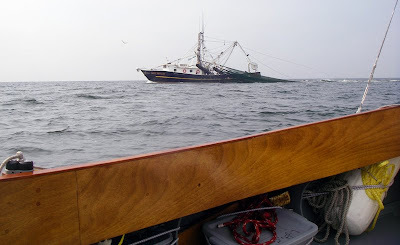 This is one of three large shrimp boats that were leaving Pamlico River turning south into the sound. I was sailing from Caffee Bay to Mouse Harbor and slowed down to let them pass well in front of me. 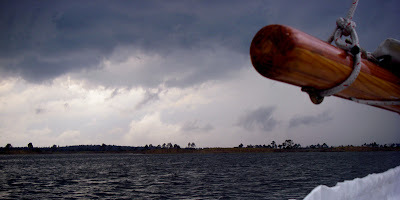 After a relaxing afternoon in Mouse Harbor, I had anchored to read and fish in Cedar Creek at the south end of the harbor, my weather radio when crazy with alerts. A line of thunderstorms and funnel clouds was sweeping across the Carolinas. I moved out to the center of the creek, raised the CB and rudder, left the mizzen raised and read a good book under the boom tent as the storm front passed by. It was a very interesting, enjoyable evening. That was two years ago. I look forward to getting back there in the next five or six weeks. Mouse Harbor will be one of two places I hope to explore on the weekend trip. 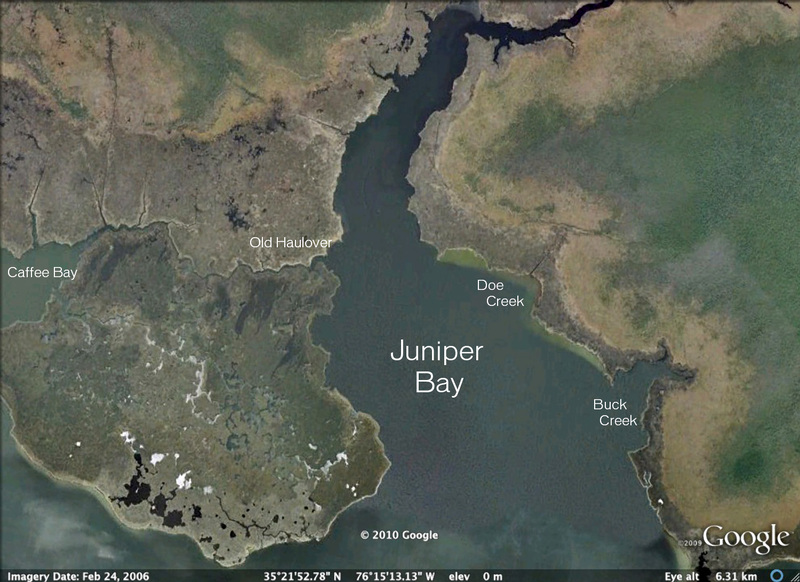 The other spot is Juniper Bay. I'll do a post on that spot soon. Our shad roe lunch plans were derailed by the train. 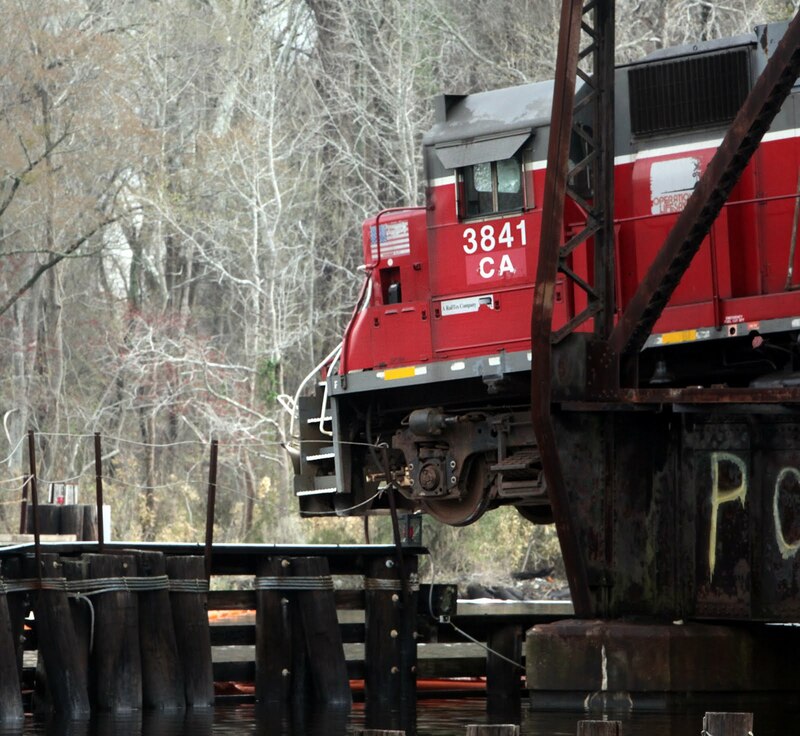 There it is below, locomotive hanging out over ICW. Nobody hurt. Some fuel was spilled but the Coast Guard was on the spot with a clean up crew. Here is another photo from my walk by the Elizabeth River the other evening. 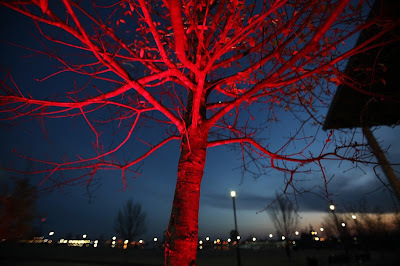 That is at Town Point Park, the river is in the background and the lights on the far side are from the old (1823) Naval Hospital. birds coming up the intracoastal waterway have not arrived yet. 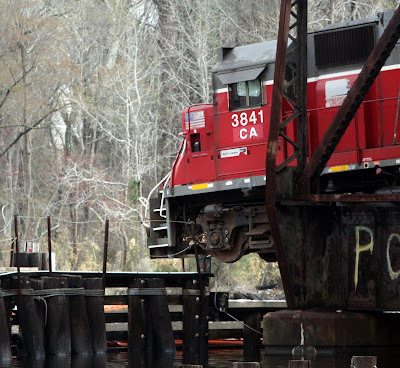 Anyone trying to come up today will be delayed as a locomotive has derailed on a trestle over the Albermarle and Chesapeake Canal. I live within a few hundred yards of this bridge but can't see it. I can hear the news helicopter flying overhead. No one was injured. They have closed the canal until they figure out how to move the train. The sign outside of Tabb's, a restaurant in the Riverview section of Norfolk, had two words on it. "Shad Roe." So I'll be heading there with a couple of friends tomorrow for lunch. We like the restaurant because of their local seasonal seafood. In the fall we go there for oysters, in May we drop by for soft shell crabs. Tomorrow it will be, for me at least, shad roe. I've never had it, but I've always wanted to give it a try. Seeing that sign reminded me of this time last year when I was invited to join Jeff, above, a Native American, for an afternoon of shad fishing on the Pamunkey River. Jeff is a member of the Pamunkey tribe and lives on their reservation. The tribal lands are on the point of land on the left side of the map, just below the road marked Pocahontas Trail. Jeff launched his skiff along with maybe a half dozen other members of the tribe. He ran downriver and fished the stretch of water below Johnson Landing. It was a beautiful, quiet river. There are a handful of tribes in the area and two of them, the Pamunkey and the Mattaponi, have reservations that were created by treaties with England that date back to the 1600's. All the these tribes were part of the once powerful Powhatan Confederacy that occupied eastern Virginia. It was on their land that the Jamestown colony was founded. 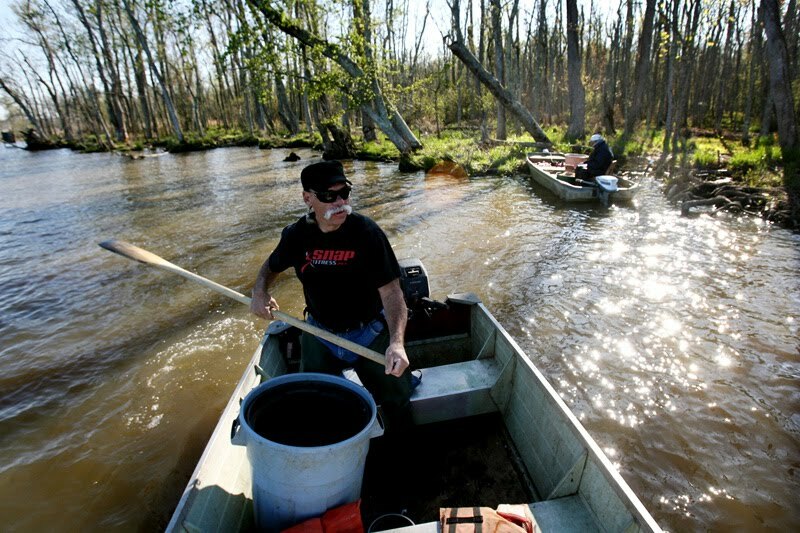 The history of these tribes dates back thousands of years and fishing these small rivers has been both a source of food and an important part of the tribal tradition. I've always found the Native Americans to be very friendly but at the same time very private. I felt honored to be allowed a peek at their way of life. Jeff was a great host, friendly and knowledgeable. He talked a lot about the tribe and the fishing. He is involved with some archeological digs on areas thought to be historic tribal centers. Like a lot of tribe members he had left the reservation when he was young but found the urge to return home as he grew older. Jeff set his nets in the late afternoon and then motored towards shore where he met up with another member of his tribe. This was an older gentleman, a man who had in fact taught Jeff how to fish. 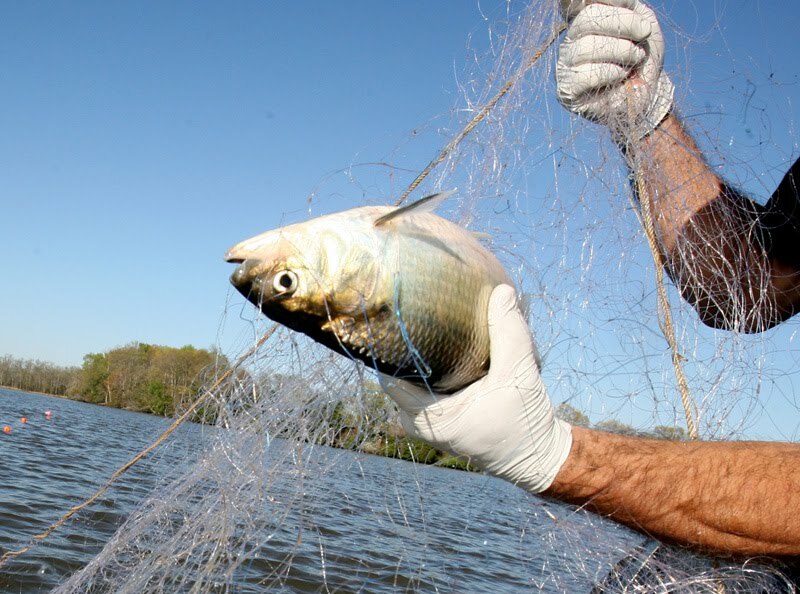 We sat along shore and made small talk while the nets drifted slowly downriver. After a little more than an hour we ran back out on the river. It was easy to see that he had caught some fish, the floats bobbed up and down as the fish struggled in the nets. 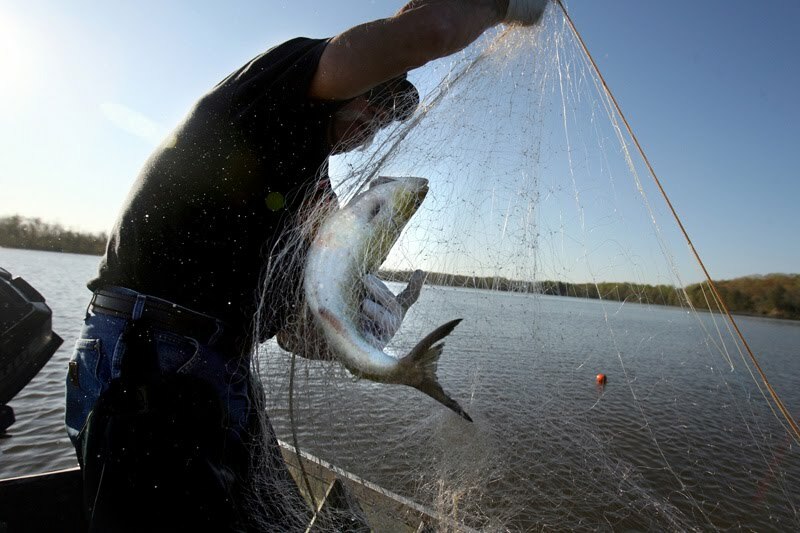 I think Jeff brought in about two dozen American Shad. Some of the fish were ripe and he milked those fish for their milt and roe. He would carry that back to the tribe's fishery where the eggs would be hatched and the fingerlings eventually returned to the river. The rest of the fish - and roe -were harvested for food. It is an afternoon that I will remember for a long time. I have of course visited Jamestown and nearby Williamsburg to see the historical sites there. But that history dates back just 400 years. A few centuries hardly compare with the 10,000 year history of the Native American tribes. And this bit of history wasn't in a museum. It was truly a living history, one that I got to see as we drifted down a gentle river in Tidewater Virginia. I had a quiet evening at the office yesterday. 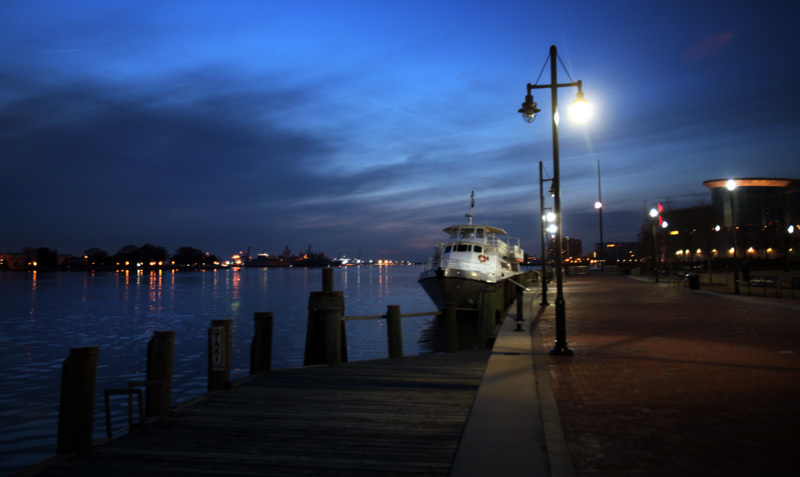 Not much going on so I walked over to the Elizabeth River waterfront. No snowbirds anchored out in Crawford Bay. Too cold. 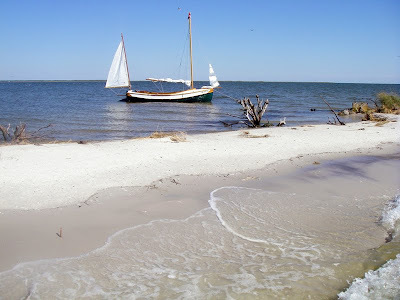 But in a week or two we'll start seeing the boats heading north along the ICW. 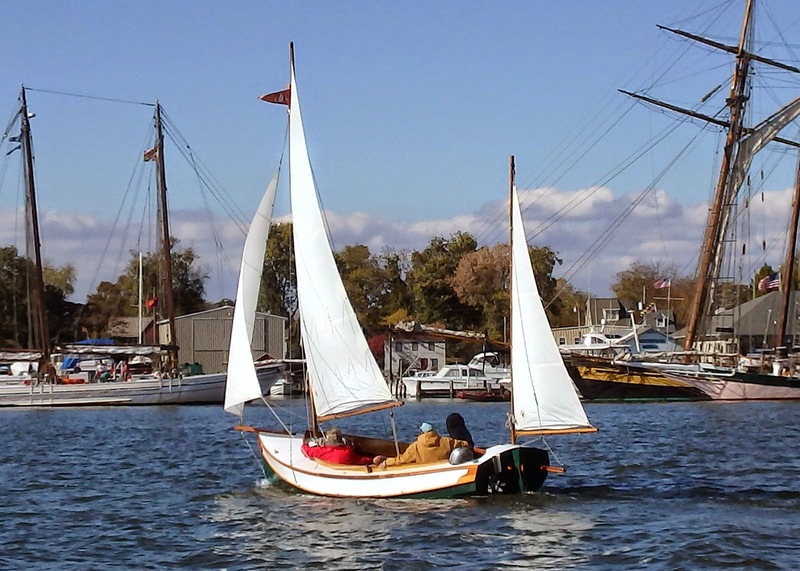 Weather looks iffy for sailing this weekend, but I do hope to get out for a while on Sunday. I'm starting to focus more and more on a long weekend trip in early May. I mentioned it a couple of posts ago here. I'll tack a couple of days on to a weekend and make it a four day trip. 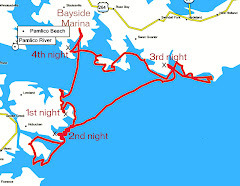 My first night out I would like to anchor in one of the little creeks of Mouse Harbor on the south side of Pamlico River entrance. 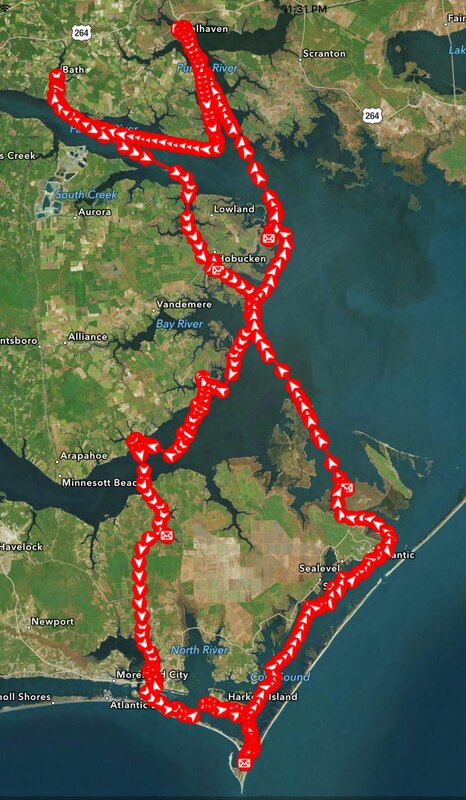 That is about 15 miles from my launching point at Van Horn's Bayside Campground and Marina. Leaving my house at dawn I would get down there by 8:30 or 9. Rig the boat, pack the boat and I would be ready to cast off about 10:30 or so (I could get the boat ready quicker, but leaving on a cruise I tend to check and double check everything). 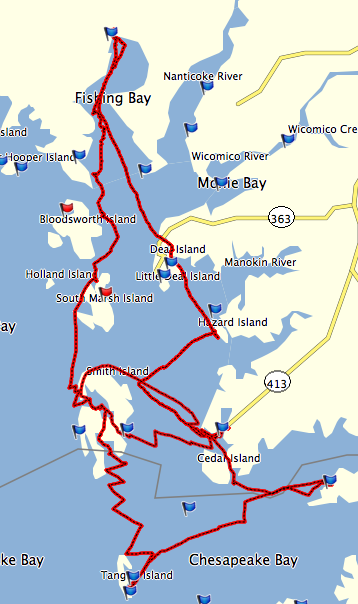 So a nice 15 mile sail down Germantown Bay, across Spencer Bay and then the Pamlico River sounds just about right. 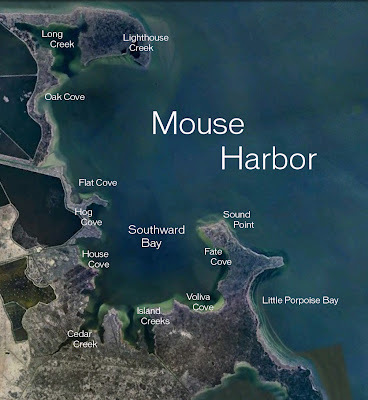 That would get me in the Mouse Harbor early afternoon, plenty of time to explore the area (it is a large, open bay with several creeks and beautiful marshes) and do a little fishing. 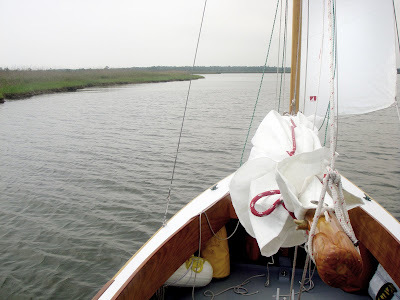 The photo above is from Cedar Creek at the very southern end of Mouse Harbor, I anchored there on a solo cruise in the fall of '08. And this little island below is well out of my cruising ground for this trip, but it is typical of the nice little islands, really remnants of eroded points, that sit just off the marshes all around the sound. You can see this one was only ten feed wide in places, just a strip of sand with driftwood and a little marsh grass. On a windy night I would not anchor behind a spot like this - but with a calm forecast it would be a great place for the evening. 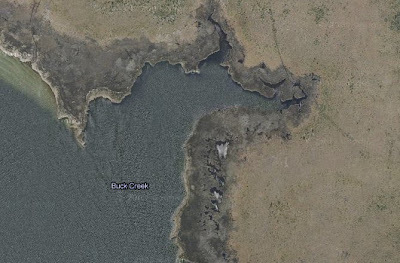 I have spotted a couple of these islets on google earth that I want to check out on this trip. I hope to explore Caffee Bay just off of Swan Quarter Bay. 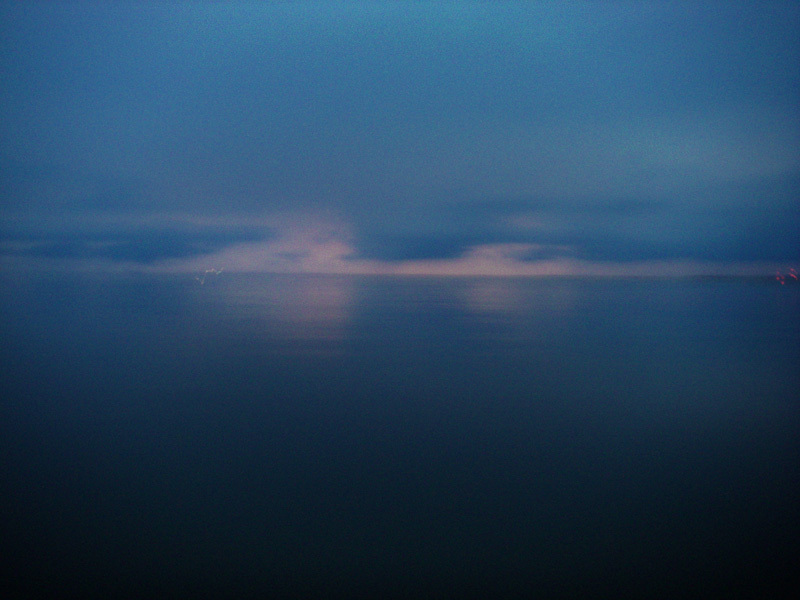 During the fall '08 trip where I anchored there next to a nice little point where I had some good luck fishing. 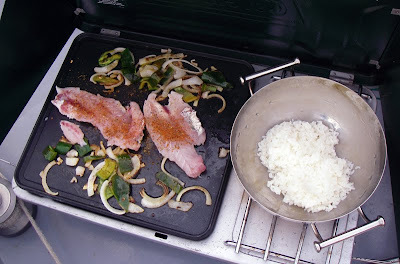 Below are the filets of a speckled trout, with chopped onions and peppers, that made for an excellent dinner. The question leaving the dock on any cruise is wind. Windfinder shows typical May winds are ten mph out of the southwest. That would be ideal, but I won't count on it. I've done two spring trips down there and have had wind from the north, west, east and southwest. I guess the good news is there always seems to be wind from somewhere. And I've got a couple of good books I'm looking forward to reading. I got a new pair of eye-glasses last fall, they have "progressive" lenses that give me a variety of prescriptions that allow me to focus on everything from distance to close-up. I really like the glasses, but they are not great for long term reading (at least for me). So I went by WalMart and ordered reading only glasses with their absolute cheapest frames, the civilian equivalent of what navy recruits call BCG's (birth control glasses -- wear those ugly standard issue glasses you'll never get a date). They aren't the fanciest glasses around, I'm more interested in reading than impressing anybody so they should work just fine. I think this will be a nice little trip. Wow, what a day on the water. Today was the perfect way to start the sailing season. Not a cloud in the sky, wind anywhere for 5 to 12 mph and 70 degrees. The photo below is from when the wind kicked up a bit, I was heeled over with the rail in the water. Just a great ride. 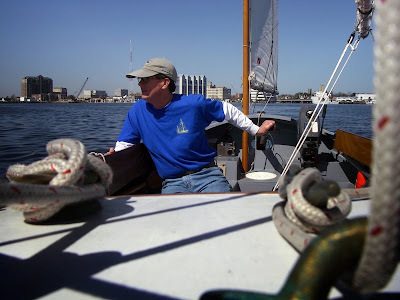 I had a lot of fun and realized just how much I enjoyed all aspect of sailing. Checking over the gear, hooking up the trailer at the house, putting the masts in place and rigging the sails - every minute was fun. I launch at a ramp behind our local triple A baseball park. 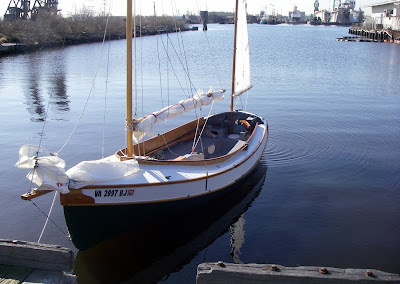 It was really nice to work in the parking lot, going over the lines, checking knots, getting everything just right while tugs worked on the river and seagulls squawked and squealed above. Very peaceful and relaxing. I'll launch from there probably a couple of dozen times this year and I know each time will be a treat. I put the new compass in place with tape just to see how it fit. 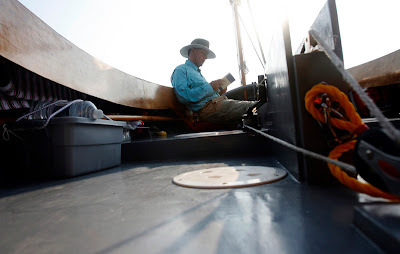 It will take some adjustment - this compass has compensation screws to deal with nearby metal and on my boat there is 100 pounds of steel just a few feet away. I may wait until Bruce is here to install it and get it adjusted just right. 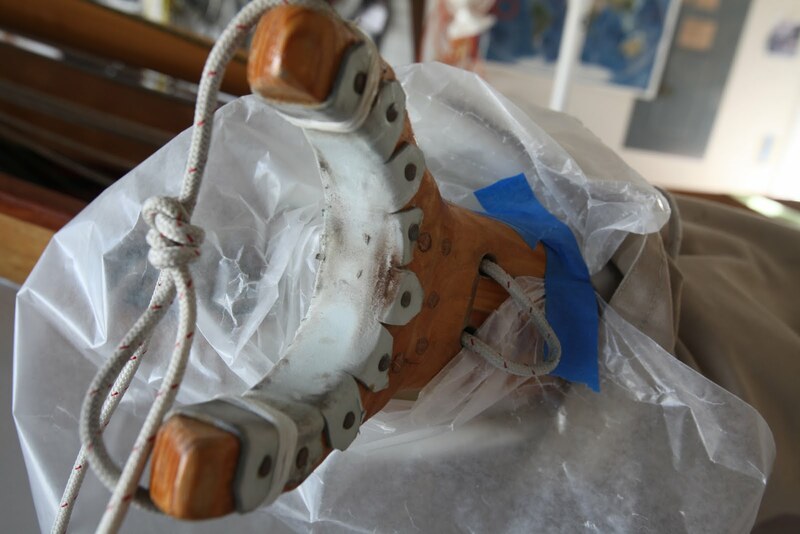 The adjustment involves sailing on a specific course while tweaking a couple of tiny screws. I will definitely need help. 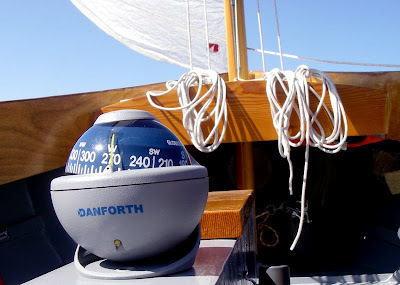 But it is good to know that the compass will fit just right on the centerboard trunk. I also fooled around with the self-timer on my waterproof point and shoot. I doubt that Bruce will be here for my Spring long-weekend walkabout down near Swan Quarter. I'll have to shoot all the photos myself. I doubt that I can match what Bruce and I do together when he brings his nice camera and one of us sails while the other shoots photographs. But I'll do my best. Below is a self portrait under sail. And this is a very nice Cape Dory Typhoon Senior that sailed by in the afternoon. I haven't seen this boat on the water before. These haven't been built since the late 1980's, but this one - called Pandora I think - was in mint condition. 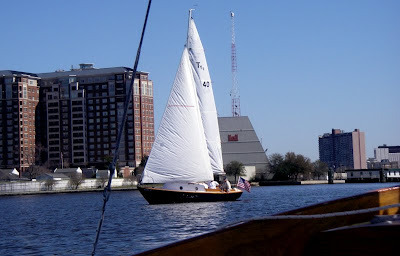 I hope to see her again on the water. And there is the "buoy" from the title of this post. That is a new "no wake" marker out on the Elizabeth River right where the river splits in to the eastern and southern branches. 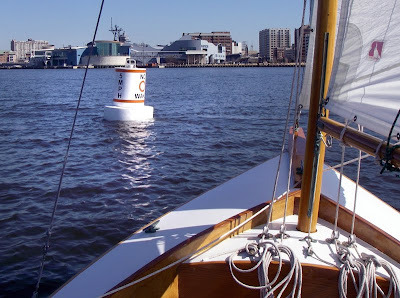 There are a few other now wake buoys out there, but one more might help remind the folks with the big power boats that they don't need to use all 250 horsepower at once. This is a great way to start out the season. To my friends up north - Kevin, Tom and Perry (and Bursledon Blogger in the UK too) - hang on! Spring is on the way. High sixties, clear skies and a nice breeze out of the north. AND I've got the day off. 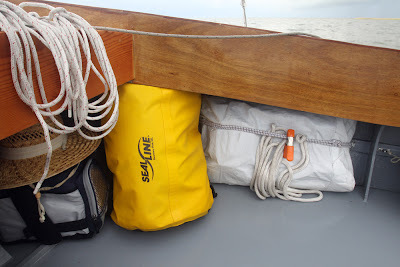 I've loaded Spartina for the season - life jackets, gps, sails, extra hats, radio with new batteries, flares and all that other stuff. We are ready to go. 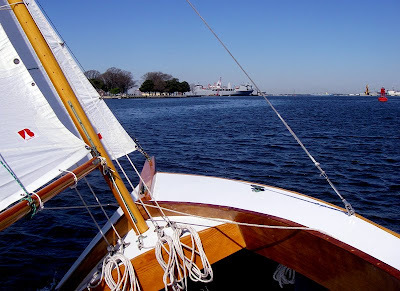 The photo below is from a Carolina cruise a few years ago (I've posted it before, sorry, I need to shoot some new photographs), but I'm hoping that is what it will look like tomorrow. Still cold and rainy. Hopefully it will clear up and warm up soon. I've started focusing on a long weekend - maybe four day - trip in either late April or early May. This will be out of VanHorn's Bayside Marina not too far from where the Pamlico River opens up on Pamlico Sound. 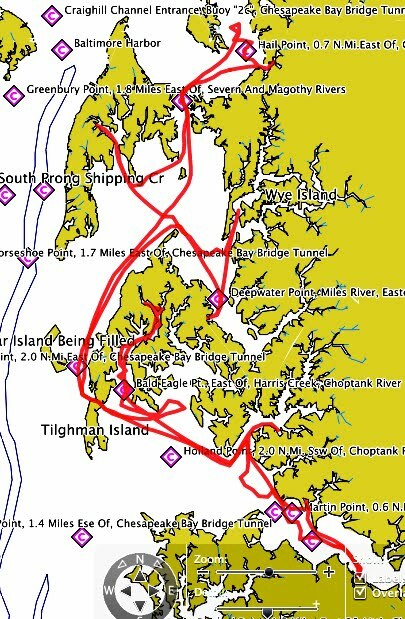 I've sailed through the area three times, twice on solo trips in '08 and then again last year with Bruce on the Skeeter Beater. Each time I pass through the area, with all the bays, creeks and island, I think to myself "I really ought to come back here and explore." That's exactly what I hope to do on this weekender trip. Sorry about the map. It looked great in photoshop, but lost something when I posted it to the blog. (If you click on the map it will open in the browser window and labels/details are much clearer). But it gives you an idea of the area and some of the anchorages. The marina is the upper left hand corner. Due south of that, across the mouth of the Pamlico River, is Mouse Harbor. I anchored there in the fall of '08 and really enjoyed it. There are several bays within the bay, lots of protection from just about any kind of wind - and good fishing too. 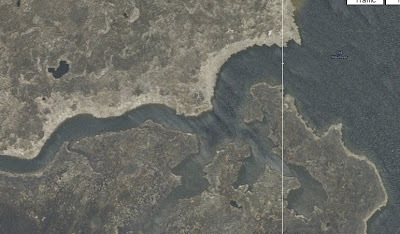 Above is Shell Bay Narrows with a part of Swan Quarter Island at the very bottom of the frame. I've passed within sight of this area a couple times, but never entered the narrows themselves. Looks like good protection and, I've heard, good fishing for puppy drum and trout. And just tonight I noticed the creek above off of Juniper Bay. It is called Old Haulover and it looks very interesting. Certainly a narrow creek and probably shallow too. Just right for a Pathfinder. And on the opposite side of Juniper Bay is Buck Creek with good protection when the wind is out of the north, east or south (southwest winds, not so hot). And south of Buck Creek is this little unnamed island, good protection from southwest winds. 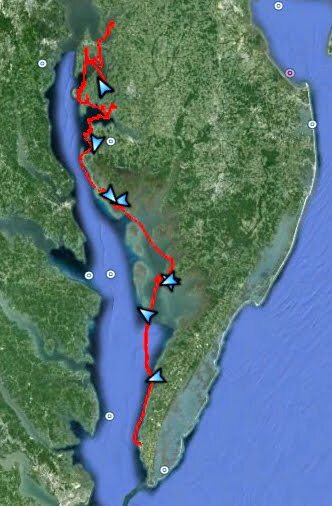 The more I look over maps and google earth the more places I find to explore just in this little 20 mile by 15 mile area. This trip won't be a lot of distance sailing. Just exploring, reading, napping and fishing. A good chance to relax and enjoy a nice long weekend. Not quite sailing weather yet. We had another small nor'easter come through the last couple of days. It has moved up north now, but coming in behind it is rain. 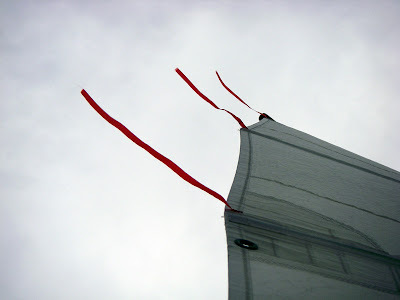 I don't mind sailing in a little rain, but not on a cold day and not on the first sail of the year. So I got out in the garage and experimented with some cooking. Years ago I read about using dough from Pillsbury crescent rolls (the kind that come in the tube) to make grilled bread. I thought that this would go great with with the beef/red wine stew (typical first night out meal for a cruise) that Bruce makes. So I gave it a try. Light coating of olive oil on the dough, pressed in some herbs and spices and put it on the grill. Less than ten minutes later I had some nice slices of bread. The trick, I learned, is keep the heat very low. That is the stove we use on Spartina, it is a Coleman propane grill/stove. I leave the grill behind and instead carry the optional griddle (a solid surface for cooking) that is in the photo above. 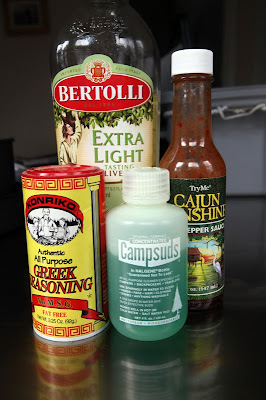 It works well for cooking meats, fish, and adding veggies for a sort of stir fry meal. 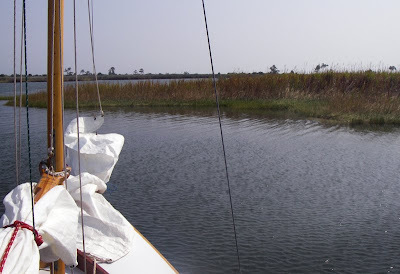 There is where the stove lives on Spartina when we are sailing, wrapped up in a white polytarp cover and bungee'd under the coaming on the starboard side. 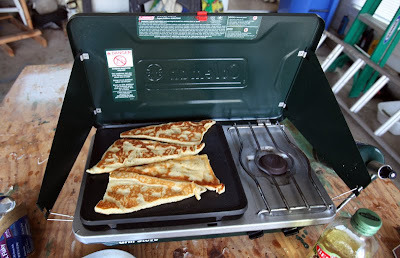 There are a lot of camp stoves out there that would take up less space - backpacking stoves, etc - but food is important on our trips and this stove really works wells. 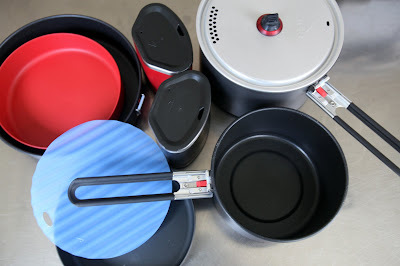 I have looked at a lot of other stoves but have yet to find one that I like better. 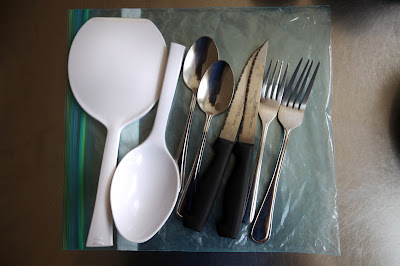 Lighter, cutting board (new for this trip, we used to use the lid of the tub) and chopping knife (also new for this trip). MSR Quick 2 System Cookset, Bruce donated it to the boat last year. It works great. There are a couple of pots, deep dish plates (which are perfect for eating on a small boat), lid with strainer and a couple of mugs. Bruce also added a frying pan to the kit. 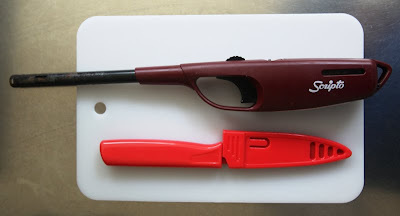 And the blue thing is a silicon hot pad for handling the gear when it is on the stove. 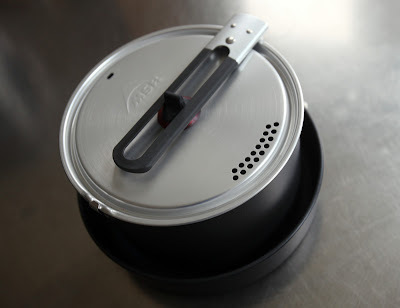 This is a very nice system and it all nests together and fits easily into the cook kit. 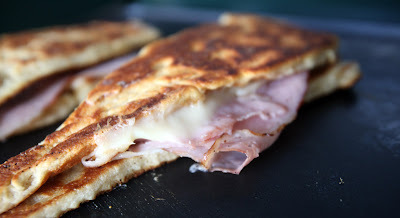 I didn't want my grilled bread to go to waste so I added some ham and cheese to make an excellent sandwich for lunch. 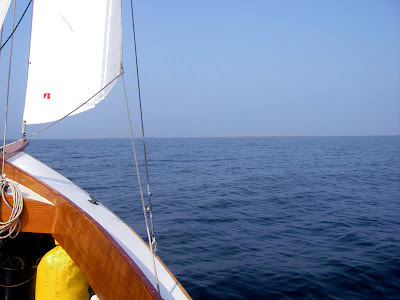 If I'm lucky with weather I'll be out sailing this coming Friday.